Offering utility, practicality, efficiency, and a peppy personality, the new 2018 Chevrolet Sonic is a primary example of the many benefits of the humble hatchback. The “Most Dependable Small Car” in North America, as awarded by J.D. Power & Associates in 2017, the 2018 Sonic is back with a renewed sense of style, capability, utility, and fun. The Sonic came onto the North American automotive scene in 2002, then called the Chevrolet Aveo. It was originally manufactured by Daewoo and sold worldwide in 120 countries under seven brands including Chevrolet, Pontiac, Ravon, Suzuki, and Holden. The original Sonic was powered by a lacklustre 1.2L 4-cylinder making a minuscule 68 horsepower. Originally a hatchback, Chevy introduced a sedan variant on the model in 2005. It wasn’t until the 2012 model year, when Chevrolet decided to switch gears and reimagine the Aveo as the newly badged Sonic. 2016 saw a refreshed facelift that stands for 2018, with new equipment. The car was infamously marketed in a commercial by driving the vehicle in a full 360-degree rotation off a ramp over an massive skateboard in an attempt to urbanize and inject the model with a youthful personality. It was dropped from a plane in a Super Bowl XLVI commercial, skydiving and doing a bungee jump to help manifest a sense of adventure in the growing model. The Sonic is also the only subcompact car in North America that’s built in the United States. With its long roofline and boxy rear-end, the Sonic is also a surprisingly capable cargo hauler. Both the sedan and hatchback offer 60/40 folding rear seats to accommodate just about anything the modern adventurer would need to transport. The standard 1.4L turbocharged 4-cylinder ECOTEC engine produces an impressively powerful 138 horsepower and 148 lb/ft of torque, helping the 46L gas tank achieve monumentally efficient fuel economy figures of 9.2L per 100km City, and a dainty 6.8L per 100km Highway. An optional 1.8L non-turbo engine is also available, but develops less torque. The 1.4L is our preferred choice, offering the optimal Chevrolet Sonic specs – and coupled to the vehicle’s silky smooth and sporty 5-speed manual transmission – or available 6-speed manual or auto, makes the power and efficiency of the little turbo an intoxicating combination. Great things come in small packages, as they say. And safety-wise, the Chevrolet Sonic is no exception. Chalked full of innovative safety features, the Sonic comes standard with 10 airbags, rear vision camera, traction control and Chevy’s StabiliTrak electronic vehicle stability control system. 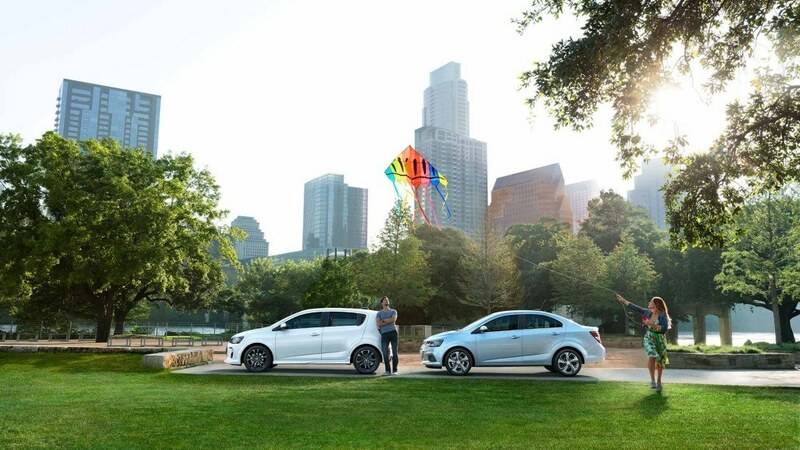 No modern hatchback would be complete without some innovative technology and connectivity features. 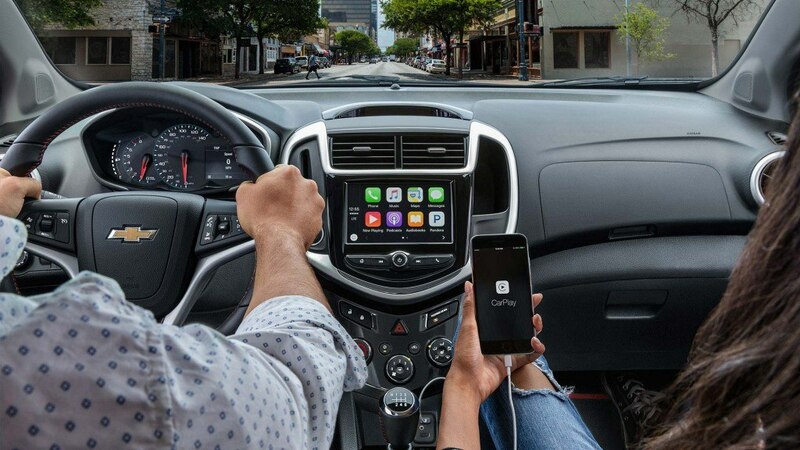 The Sonic comes to this battle very well-equipped with a plethora of cool gadgets and features, like Apple CarPlay and/or Android Auto Compatibility to connect your smartphone to the Sonics’ 7-inch diagonal colour touch-screen display. Access your phone, contacts, music, maps, and messaging apps to help keep you connected. Manage the integrated 4G LTE Wi-Fi Hotspot (allows you to connect up to 7 mobile devices at any given time). Send directions directly to your vehicle with available OnStar turn-by-turn Navigation. 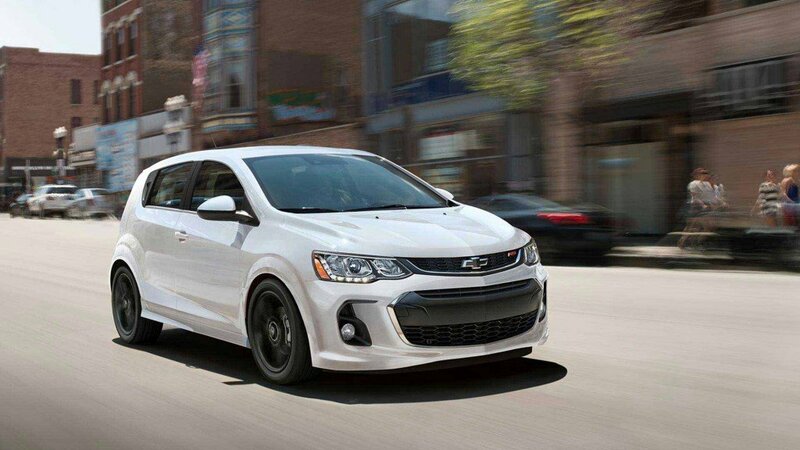 The modern hatchback is a staple of the urban landscape, and the Chevy Sonic is no exception. Catering to the modern commuter who always has epic weekend adventures in the back of their mind, the Sonic makes a serious statement and has carved out a space for itself as an exciting, safe, and tech-friendly vehicle for 2018.